Fastpitch softball is a great sport that fosters teamwork, competitiveness, leadership, and positive physical activity. Whether through team bonding or individual accomplishments, it has the ability to fill you with pride and confidence on and off the field. Of course, to play the sport correctly, you need a bevy of different equipment. Batting gloves, fielding gloves, sliding shorts, cleats, and, specifically, bats are absolute necessities in the game of softball. But, what makes a high quality fastpitch softball bat? Which ones should you be considering in this day and age? This guide will give you all of that information and more. Louisville Slugger is responsible for some of the premier bats on the planet today. Their products are used by Major League Baseball players and a bevy of other players of all ages and skill levels. Of course, they aren’t limited just to baseball. They also manufacture great products for softball players. One of their top products for softball players at the moment is the Louisville Slugger Xeno Plus Fastpitch Softball Bat. Its combination of balance and power gives it the ability to raise the performance of any player’s game. Let’s start by talking about its length and weight. It has a drop weight of -11 and is available in 6 different sizes. These sizes include 28 inches, 29 inches, 30 inches, 31 inches, 32 inches, and 33 inches. This gives players both short and tall the ability to make use of its many glowing characteristics. A two-piece bat, it provides you with a stiff handle and a flexible barrel, giving you both great control and power. Its handle measures in at 7/8 of an inch in diameter while its barrel measures in at 2 ¼ inches, meeting standardized requirements in almost all softball leagues. Connected in the middle of the bat, it’s constructed very solidly and leaves no feeling of emptiness and hollowness. You will certainly feel when you’ve made great contact and will absolutely see results if you do. Made of a composite material, it is both incredibly light and very durable. Its barrel is double-walled, giving it as much bounce and flex as is possible, and providing you with an oversized sweet spot. You won’t have to make perfect contact every time to come away with extra base hits and home runs. It is incredibly forgiving. Despite its composite construction, it’s very balanced, with a large amount of its weight resting toward its handle. To provide you with great feel and comfort, it has a padded, synthetic cover over the handle. Online reviewers love it for its very large sweet spot, stating that it provides a great deal of power whether or not you hit the ball squarely on the barrel. They also give it credit for how easy it is to control, noting how balanced it feels, and how easy it is to get through the strike zone quickly. One reviewer was disappointed with the amount of pop it provided, but was an exception to the overall consensus. All other reviewers considered it to have better pop than any other bat they had ever used. Some even said that it they were contact hitters until they bought it. Now that they use it, they’re hitting doubles, triples, and home runs. Overall, the Louisville Slugger Xeno Plus Fastpitch Softball Bat is a great product with lots of power. Remarkably balanced for a bat of its power, it provides you with both confidence and control at the plate. If you’re a softball player and want something that is going to give you as good of a chance as possible up at the plate, the Louisville Slugger Xeno Plus Fastpitch Softball Bat is definitely something to take a look at. It’s available for around $200.00 on most online retail sites. Easton has been a reputable name in baseball and softball for quite some time now. Their products stand up proudly next to any other products of their ilk. The company’s premier fastpitch softball bat at the moment is the 2016 Easton FP16S312 FS3 Fastpitch Softball Bat. Providing you with a great deal of control and feel, it will give you total confidence at the plate. It comes with a -12 drop weight, and is available in seven sizes. These sizes include 28 inches, 29 inches, 30 inches, 31 inches, 32 inches, 33 inches, and 34 inches. This allows you to make use of it regardless of your size or length preference. Its handle measures in at 29/32 of an inch while its barrel measures in at 2 ¼ inches. With a two-piece construction, it offers a very flexible barrel and a very stiff handle, giving you both power and control. Both its barrel and handle are made of a composite material that is connected firmly in the middle of the bat. You won’t have to worry about getting less-than-perfect distance on a well-stricken ball. It has a huge sweet spot due to its double-walled barrel construction style. This will cause the bat to compress more-so than the ball, giving the ball great flight distance whether or not it was hit directly in the middle of the barrel. Online reviewers love this bat for how well it’s balanced, stating that it’s easy to control through the strike zone and has made a noticeable difference in their hitting since they started using it. They also give it credit for its power, saying that the ball seems to jump off the barrel. Some reviewers criticize it for its durability, with one person stating that they heard something rattling around inside of theirs. This, however, was an isolated incident and is probably not indicative of the product overall. The only other slight complaint is that it takes some time to break in. However, once it does, it performs magnificently. All in all, the 2016 Easton FP16S312 FS3 Fastpitch Softball Bat is a high quality product with excellent balance performance. Providing you with an oversized sweet spot and stiff handle, you won’t have any trouble making contact at the plate. 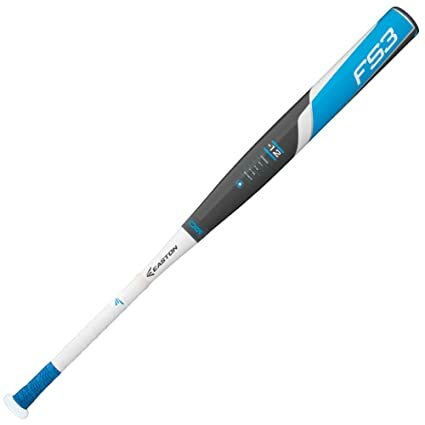 If you’re a softball player of any age or skill level, you should definitely take a look at the 2016 Easton FP16S312 FS3 Fastpitch Softball Bat. It’s available for around $115.00 on most online retail sites. DeMarini has a reputation for making high-performing and aesthetically pleasing sports equipment of many different kinds. The company especially excels when it comes to baseball and softball. Their top softball bat at the moment is the DeMarini 2016 Uprising Fastpitch Softball Bat. Its solid construction and excellent power make it a great choice for anyone looking to get the ball in play on a consistent basis. With a -12 drop weight, it is available in five different sizes, including 28 inches, 29 inches, 30 inches, 31 inches, and 32 inches. This allows players of all different sizes and strengths to choose a bat that they feel comfortable with. With a 7/8 of an inch handle and a 2 ¼ inch barrel, it’s very easy to control, providing you with excellent weight distribution. Unlike the bats we just reviewed, it is made of aluminum alloy instead of a composite material. This, however, does not do much to hurt its overall performance. It still does a great job of reducing vibration while also providing you with excellent power and contact. The only problem you will run into is that its sweet spot won’t be quite as large. You’ll have to make more perfect contact. However, if you do, you will hit the ball just as hard if not harder. And, because it’s made of aluminum and not composite, it is more durable and will hold up better over time. Online reviewers give it credit for how easy it is to get through the strike zone quickly, stating that they have no problem catching up with fastballs while using it. Reviewers also laud it for its power, stating that it has greatly improved how far and how hard they hit the ball in general. Some reviewers complained that it didn’t have the biggest sweet spot they’ve ever used, noting that they had to make fairly solid contact to get the ball to go anywhere. A few reviewers also stated that it doesn’t measure up to composite bats when comparing their power. Overall, the DeMarini 2016 Uprising Fastpitch Softball Bat is a nice bat with a great deal of durability and balance. It gets through the strike zone quickly and is able to hit the ball with some pop when solid contact is made. If you’re looking for something that can withstand wear and tear while also giving you a great chance at the plate, you might want to consider the DeMarini 2016 Uprising Fastpitch Softball Bat. If you’re going to practice your hitting by yourself either in the cage or the back yard, you’re going to need your own bat. But, maybe you don’t want to spend hundreds of dollars on one. Maybe you don’t have the money. Maybe you just don’t see the point. Fortunately, there are a number of great bats available for very affordable prices. One of these bats is the Easton MAKO 11 Fastpitch Softball Bat. With a -11 drop weight, it comes in six different sizes, including 25 inches, 26 inches, 27 inches, 28 inches, 29 inches, and 30 inches. While there might not be a size available for a larger player, there are certainly plenty of sizes for smaller players who are looking to get the bat through the zone quickly. Its handle measures in at 29/32 of an inch while its barrel measures in at 2 1/4 inches, providing you with great balance and excellent weight distribution. It’s made of aluminum, but still provides a great deal of pop when hit solidly. It does have a smaller sweet spot than composite bats, but still provides excellent shock absorption, and is very easy to handle. In addition, it’s easy to get through the strike zone, providing you a great chance of catching up to fastballs. Online reviewers give it credit for its power and how easy it is to get through the strike zone, stating that when good contact it made, the ball travels far. A negative remark made about it is that it is prone to denting. Many reviewers stated that it eventually became unusable due to its many dents. Overall, the Easton MAKO 11 Fastpitch Softball Bat is a good bat for its price. While it sacrifices something in the way of durability, it still provides excellent control and power. 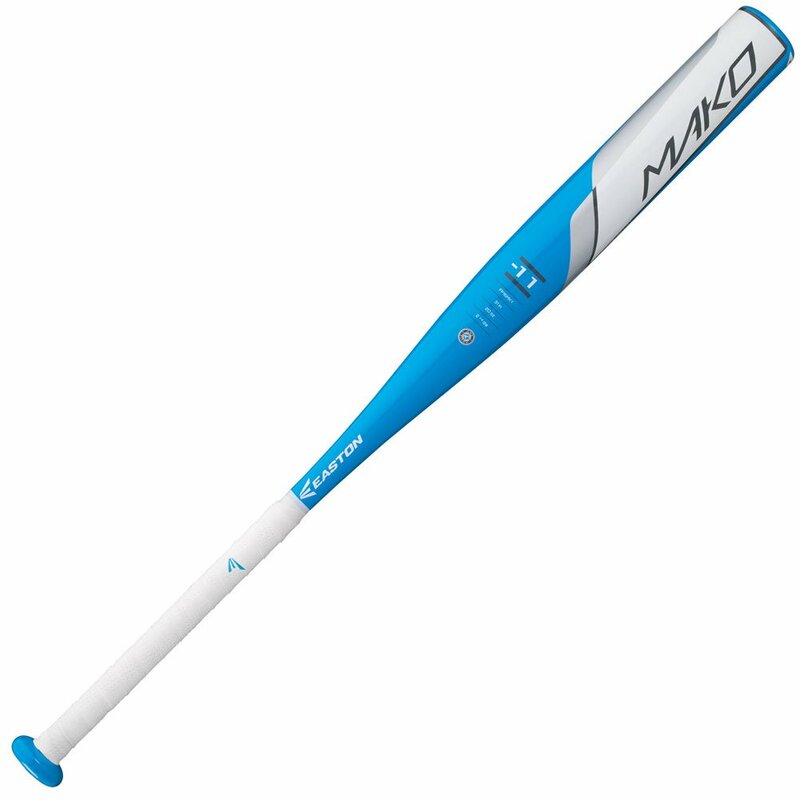 If you’re looking for something to use in the cage, or are just looking for a cheap, quality bat in general, you should definitely give the Easton MAKO 11 Fastpitch Softball Bat a shot. One of the most important aspects of a softball bat is its length. If you use one that’s too long, you will have trouble getting it around in time. If you use one that’s too short, you will sacrifice power. It’s important to find one that meets the correct balance so that you have the best chance of making powerful contact with the ball every time you come up to bat. If you’ve played softball for a while, you probably already know what lengths work best for you. However, if you haven’t, there is a rule of thumb that you can follow to find the correct length. The rule goes as follows: grab the bat by the knob on the handle and place the other end flat on the ground. If – standing straight up with your arm extended straight down – the handle meets your wrist, the bat is of an appropriate length. Generally, players between 57 inches and 60 inches should use a bat between 29 inches and 32 inches in length. Players between 61 inches and 64 inches should use a bat between 29 inches and 33 inches. Players between 65 inches and 68 inches should use a bat between 30 inches and 33 inches. And, players who are 69 inches are taller should use a bat that’s between 31 inches and 34 inches. Of course, it’s important to get a certain feel for the bat, regardless of how long it is. These are only guidelines, and are by no means a strict rule. When considering the weight of a softball bat, it’s important to understand the concept of “drop weight.” Drop weight refers to the difference between a bat’s length and its weight. For example, if a bat is 32 inches long and has a drop weight of -10, it will weight 22 ounces. American Softball Association rules dictate that you can’t have a bat with a drop weight exceeding -12 ounces. Traditionally, contact hitters will use something with a higher drop weight while power hitters will use something with a lower drop weight. This is because contact hitters need something that will get through the strike zone quicker while power hitters need something with a little more weight behind it. If you’ve got trouble catching up to fastballs, you might want to consider something lighter. If you have no problem catching up to fastballs, you’ll probably want to go heavier as it will provide you with more power. Again, of course, this is not a strict guideline. You should test out a bevy of weights to get a feel for what you’re most comfortable with. There are several different characteristics and features you must consider with every bat your peruse. These features will provide you with certain benefits while also carrying certain drawbacks. One of these features is trampoline effect. This refers to how much bounce the ball gets off the barrel. A stiffer barrel is going to cause the ball to compress more, causing it to lose energy and lessening its flight distance. A softer barrel is going to cause the bat to compress more than the ball, resulting in a longer flight distance. Another feature to consider is bending stiffness. This refers to how much the bat is able to flex and is directly related to how much sting you receive when you hit the ball with something other than the sweet spot. A bat with higher bending stiffness is going to cause a lot more vibration and sting than a bat with lower bending stiffness. The last feature to consider is swing weight. Swing weight refers to how easy the bat is to control. One with poor swing weight will be top-loaded and difficult to control, while one with excellent swing weight will have its center of balance closer to the handle. There is no numerical way to measure these statistics. They’re just some things to keep in mind when testing a bat out. In general, bats are made of two materials. These two materials include aluminum and composite. Aluminum bats often have a higher trampoline effect, but also often have a much smaller sweet spot than do composite bats. This is because they have a lesser bending stiffness than composite bats. However, aluminum bats also traditionally offer a better swing weight as they are more balanced towards the handle and not the barrel. Composite bats are often made of several different materials, such as graphite and carbon fiber. This allows them to have stiffer handles with more flexible barrels, allowing for both excellent control pop. Typically, composite bats are the better choice overall. They sometimes aren’t as balanced as aluminum ones, but generally beat them in every other category. Of course, this also means that they cost a little more. But, in the end, the choice is up to you. You should choose a bat with which you feel comfortable. If you’re a fastpitch softball player, a fastpitch softball bat is a very important and useful piece of equipment for you to possess. Sure, you could use a teammate’s bat, but then you wouldn’t be able to practice by yourself, whether in the cage or the back yard. But, not all bats are the same. They each have different properties and characteristics that offer certain benefits and certain drawbacks. Before purchasing one, you must do research to ensure that you’ve chosen one that fits all your criteria, whether that criteria be price and durability, or performance and comfort. Only after you have done this can you select a bat that is perfect for you.